Doubts raised over allegations Mohammed Khader killed by Jews in 'revenge' attack; father said 'Arabs' tried to kidnap younger son earlier. In a little-noticed report on Channel Two Wednesday night, analyst and reporter Moshe Nussbaum presented information which could upend the police inquiry into the murder of Muhammad Abu Khadr, the Beit Hanina youth whose burned body was found in the Jerusalem Forest early Wednesday. In the report, Nussbaum cites contradictory statements by the youth's parents, who both told police different stories about another attempted kidnapping – that of Muhammad's nine year old brother – that may or may not have taken place. Speaking on Israel Radio Thursday, Mohammed's father said he had called police at about 4 a.m. Wednesday to tell them that his son was being kidnapped, and said that they could trace his cellphone, which was still active. Police have not commented on the content of the call Mohammed's father said he made. However, Nussbaum said, police were quite definitive that another call the family made to police on Tuesday turned out not to be the emergency the Abu Khadrs claimed it was. On Tuesday, police said, the mother called police to say that “settlers” had tried to kidnap her younger son. She said that individuals had stopped a car in front of her house where she was sitting with her son, and that they tried to grab him. She managed to hold onto him, she said, and they left, at which point she called police. Officers arrived a few minutes later to take her statement, in which she said “settlers” had tried to kidnap her son, but could give no details. However, a few minutes later the father arrived, and he disputed his wife, saying that it was Arabs who tried to kidnap the son. Police asked the father if he was positive regarding the identity of the would-be kidnappers, and he said he was. When they asked him to file a police complaint, he said he would, but that he would come down to the police station later on to do so in order to be able to comfort his son. He never showed up, police said, who contacted him several times asking him to file the complaint – but to no avail. When asked on Israel Radio as to the identity of the kidnappers, Mohammed's father said he did not know – but that it should be an easy matter for police to figure it out, because their images were captured on video by one of the many security cameras in the area. “All they have to do is put the pictures on TV and I am sure someone will identify them,” he said. 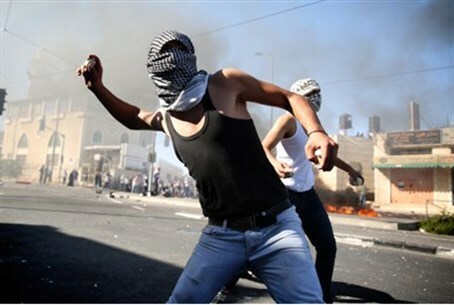 Assumptions by Arabs in Jerusalem that Jews had committed the murder in revenge for the kidnapping and murders of Israeli teens Eyal Yifrah, Naftali Frenkel, and Gilad Sha'ar​ led to wide-scale rioting throughout the day Wednesday. The rioting caused serious damage to the capital's light rail service, which city officials say could take weeks to repair. Speaking to Arutz Sheva Wednesday, a senior former police official opined that the abduction and murder of Al Khadr was most likely a criminal act, rejecting the claim that Jewish "revenge" for the murdered Israeli teens lay behind it. The official noted that the family of the murdered 16-year-old was well known to police sources in Jerusalem. "It's a problematic family with internal clashes that have been ongoing for many years. I have no doubt that as time passes it will be clarified that the murder was criminal and nothing more," the ex-official said, speaking to Arutz Sheva on condition of anonymity. Police, for their part, have refused to speculate over the motive for the killing and say that at the moment they are pursuing all possible leads - both nationalistic and criminal.